Why do we no longer trust experts, facts and statistics? Why has politics become so fractious and warlike? What caused the populist political upheavals of recent years? How can the history of ideas help us understand our present? In this bold and far-reaching exploration of our new political landscape, William Davies reveals how feelings have come to reshape our world. Drawing deep on history, philosophy, psychology and economics, he shows how some of the fundamental assumptions that defined the modern world have dissolved. With advances in science and medicine, the division between mind and body is no longer so clear-cut. The spread of digital and military technology has left us not quite at war nor exactly at peace. In the murky new space between mind and body, between war and peace, lie nervous states: with all of us relying increasingly on feeling rather than fact. In a book of profound insight and astonishing breadth, William Davies reveals the origins of this new political reality. 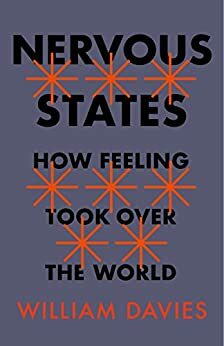 Nervous States is a compelling and essential guide to the turbulent times we are living through. The first thing that the prospective reader should be wary of is the book's title. To me it suggested something quite different than what the book actually attempts to deliver. For example, I thought it might concern the most obvious example of the manner in which reason, logic and argument were supplanted by feelings: the transition from the enlightenment to romanticism. The latter is an enormously complex subject, but T. E. Hulme thought that the phenomenon/movement had run its course by the early 20th century. This proved not to be the case, of course. Why? A second possibility: the movement from British empiricism to German idealism. The pivotal philosopher for the post-enlightenment/burgeoning romantic world is Kant (even if he is, ultimately, less consequential than Wittgenstein). Kant caps a trend of privileging the individual perspective over the notion of shared knowledge, shared perspective, cultural and personal commonality. The more subjective the perspective, the more we are dependent on feelings rather than commonly-shared, objectively-demonstrated truths. This was all anticipated, of course, in M. H. Abrams' THE MIRROR AND THE LAMP (1953) and extended in his NATURAL SUPERNATURALISM (1971). I would pay a great deal of money for an updated version of THE MIRROR AND THE LAMP, taking us from the 19th to the 21st century. Within literary culture, of course, the thought of the French Nietzscheans is an extensive attempt to undercut empirical truth claims and valorize the personal over shared beliefs anchored in science. There was, of course, a grand but failed attempt to undercut scientific truth claims in general, to relativize them and deplete them of their cultural and intellectual impact. These academic efforts were of a piece with the academy's sympathies for identity politics and other foundational principles of the contemporary left. This is the same academy which is not troubled by the assertion of dozens of different genders, in the face of DNA evidence, and the underwriting of individuals' wishes to choose their genders and have their personal choices (again in the face of DNA evidence) supported by the enforcement powers of the state. This, it would seem to me, is an example of 'how feeling took over the world'. That, however, is not really what this book is about. What it is about is not entirely clear to me. The argument appears to be that the 17th century offered a scientific norm—free-flowing scientific information which was neither secret nor proprietary and commanded the world's respect and assent. This respect and assent have been lost, particularly because of modern technology and it would behoove us to recapture that solidity and commonality, lest we perish. I think that is an important argument, though it grossly oversimplifies the nature of 17th and 18th century science. That science was grotesquely lampooned, e.g., by the Tory satirists. Science was perceived to be so politically sensitive that Bishop Sprat was chosen to write the early history of the Royal Society to allay concerns among the religious. Similarly, politics was kept off the table at the Society's meetings because of the threats it posed to that group's welfare and success. NERVOUS STATES romanticizes 17thc science to a considerable degree and overlooks the powerful and often violent feelings surrounding it. I support the notion of valorizing science over feelings, but I would look to other examples than the author, e.g. the emergence of congresspersons and millennials who carry a deep affection for socialism that seems to show little awareness of the nature of actual life under socialist regimes. They do not want to be confused by facts and they are driven by powerful feelings. William Davies, on the other hand, is more troubled by 'climate deniers' though he gives little attention to the diddling with the numbers by climate assertors or the fact that some 7,600 years ago the oceans rose significantly and turned the Black Lake into the Black Sea, an event often associated with the notion of Noah's Flood, and one that occurred before the invention of Buicks and 747's. That is fine; we can argue about details and science should be our guidepost, not feelings. The problem is that the book becomes less and less empirical and more and more metaphorical as we proceed to the end. We note, e.g., that tapping an iPhone screen is to issue a 'command' and to issue a command is to participate in a quasi-military activity, which is no surprise because computers were initially developed for military purposes and, despite their protestations, current IT moguls are developing vast data bases which could be used for both military and crass commercial, money-grubbing purposes, and then used by the Russians to compromise our elections, etc. etc. etc. I respect metaphorical argument, but it is far more literary than scientific and in some ways no less respectable. The problem is that we have been there before. NERVOUS STATES eventually devolves into a sort of Pynchon novel without the depth of insight, the relative absence of partisanship and the literary genius which Pynchon exhibits. If you want to read about communication systems and their interplay with paranoia and, potentially, real-world, real-life threats, read THE CRYING OF LOT 49, not NERVOUS STATES. In fairness, readers might wish to look at the reviews of the book on Amazon.co.uk which to date have been far more favorable than my own. "Contemporary nationalism is tightly bound up with problems such as physical pain, ageing, chronic illness and a sense of deep pointlessness, that otherwise finds outlets in addictive and self-destructive behaviour, through which feelings of meaning and personal control can be briefly achieved. The urge for violence is often a distortion of the urge for safety." If this is your cup of tea, have at it. For me this is kneejerk ideology dressed up in academic rhetoric. Some of us associate contemporary nationalism with the desire to have China stop appropriating our intellectual property, for NATO partners to meet the terms of their contract and for unelected EU apparatchiks to stop dictating to farmers on the proper shape of cucumbers or the proper shape and number of bananas in a given bunch.